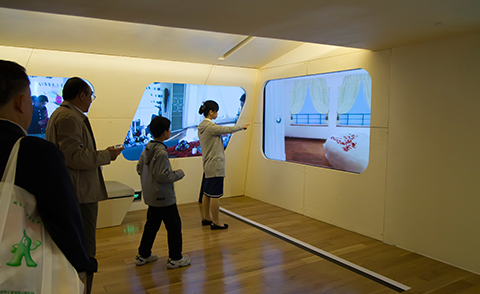 Controlled Immersive Surfaces Signs, Displays and Games. Back in 1986, we invented and shaped the field of 'applied computer vision' for computer-human interaction, and have continued as world leaders, inventing new video gesture control technologies ever since. advertisements, virtual gaming systems and other interactive surface computing solutions, many with multi-touch interactivity. Our technology is used in museums, science centers, amusement parks, trade shows, retail locations, bars & nightclubs, real estate presentation centers, corporate showrooms, boardrooms, digital signage networks and other public spaces such as airports and stadiums. We’re also revolutionizing television production, game development, advertising, virtual videoconferencing, and even the healthcare sector, by applying our technology in unique and innovative ways. 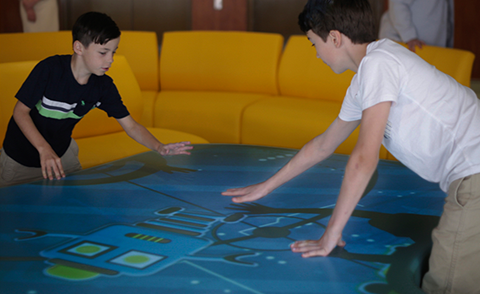 The revolutionary GestureFX product line offers interactive gesture controlled surfaces, projected onto any floor, wall, table or displayed via LCD, controlled with simple hand, foot & body gestures. Scalable to any size on any surface, GestureFX is prefect for digital signage, in-store entertainment, product info & immersive experiential environments. Enabled to share real-time media from tablets or mobile devices, along with beacon & custom content capabilities. GestureFX comes pre-loaded with a minimum of 50+ eye-catching special effects environments. GestureTek offers creative and design services to customize and optimize your campaign. Our production team can help incorporate your ideas into any GestureFX interactive system, mixing 2-D and 3-D graphics, sound and video in any way. GroundFX is multimedia visual display system that projects incredible interactive special effects, games or advertisements directly onto any floor of any size. 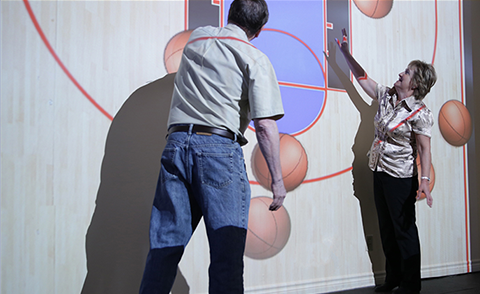 Utilizing GestureTek's patented GestureFX technology, users control dynamic multimedia interactive displays with simple gestures and body movements allowing for real-time motion control and interaction with display graphics. It’s an engaging full-body interactive experience that immerses users in your message and endears them to your brand or campaign. Stop people in their tracks by projecting dazzling special effects onto any wall or vertical surface. A dynamic, full-body interactive wall experience where the user controls interactive effects, advertising and games with simple hand and body motions is a definite crowd pleaser in location-based entertainment facilities, retail venues and public spaces. ScreenFX displays utilize a patented, camera-based system that actually looks out at the surrounding area and reacts directly to movement. Customers can't ignore digital signage that tracks their gestures and creatively responds with dazzling effects. As people pass by the dynamic and engaging ScreenFX display, they instantly notice their movement magically creating stunning changes to the graphical content. ScreenFX can also be used on store front windows, creating head-turning interactive gesture controlled advertising displays. TableFX turns an ordinary horizontal surface into an interactive table, bar or countertop, projecting incredible interactive advertising, games, images and special effects for the enjoyment of patrons. With effects similar to GroundFX, TableFX is perfect for nightclubs, restaurants and location-based entertainment venues. 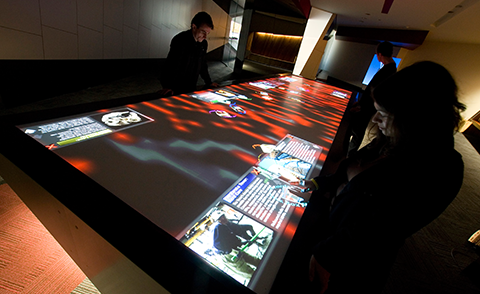 Tables can also be delivered with multi-touch capability, for collaborative and multi-user experiences. 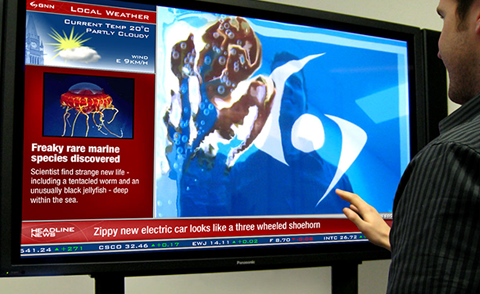 Looking for a compact, turnkey, ‘plug and play’ interactive display unit? 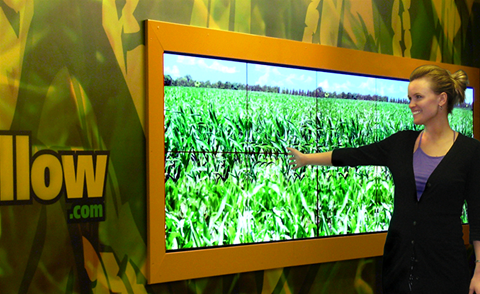 The Cube projects an interactive 100" diagonal display (up to 130") onto any floor. It’s portable, less costly than a permanent component system, and comes with the same great GestureFX applications and games. GestureTek and its resellers use the CUBE to create amazing content that immerses users in interactive floor projections for any environment. ScreenXtreme revolutionizes public space advertising and entertainment. This immersive interactive digital signage and display solution transports people’s real-time images right into the heart of a digital display, advertisement or computer-generated environment. People see themselves onscreen as they control dynamic images, advertisements, games and special effects. They become completely engaged in an immersive full-body experience as they interact with the onscreen content. The GestureXtreme virtual world gaming experience transports your image into a computer-generated landscape. See yourself onscreen as you maneuver a thrilling adventure simulation or interact with onscreen characters and objects in real time. Your body motion controls the program, giving you an unencumbered full-body immersive experience. GestureXtreme works with or without green screens, so you can install it nearly anywhere to deliver a “Wii-like” gaming experience with no special gear or equipment required. 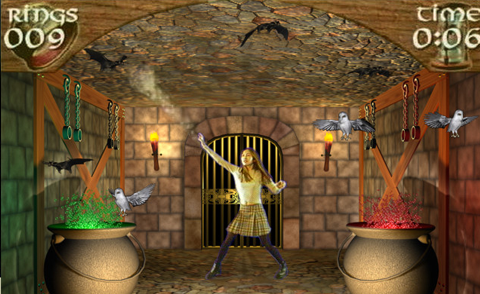 More than 1,000 GX virtual gaming systems, edutainment games and adventure simulations are currently installed in museums, science centers, amusement parks, tourist attractions, sports halls of fame, retail stores, restaurants, hotels, location-based entertainment facilities and other public spaces worldwide. GestureTek is proud of its GestTrack3D SDK, the first patented 3D gesture control software. GestTrack3D lets you control interactive displays and digital signs from a distance with hand and full body gestures. 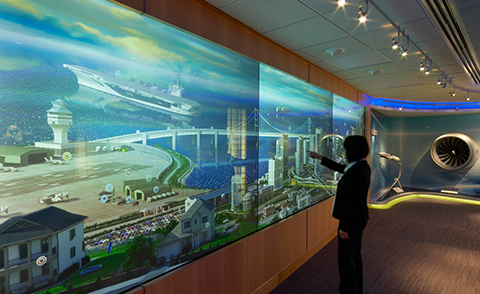 Navigate 3D game worlds, & interact with virtually any computer system or public display without ever touching it. GestTrack3D's robust tracking enables device control through a wide range of gestures and poses. GestTrack3D is the perfect solution for pixel accurate, reliable, off-screen computer control in interactive environments because the user does not have to stop to be measured or calibrated with the system, but instead can walk up and begin interacting right away. The GestTrack3D Hand Tracker drives touch-free cursor control on Windows-based applications by measuring the position of a user's hand(s) within an adjustable volume and distance from the camera. The tracker can follow one hand or two hands to create a multi-touch mode, and can track the XYZ coordinates of up to ten hands simultaneously. The multi-tracker detects multiple data points on the user's body (head, torso, hands). The tracker can recognize circle and swipe gestures and can support activities such as scrolling, enlarging, shrinking or rotating items. Tracking gestures have been used to control 3D navigation, as well as joystick, driving and drumming simulations. GestureTek has produced and delivered hundreds of Multi-touch tables for different clients in various vertical markets. The 48" GestTable is the ultimate multitouch table, with 100 simultaneous real time and instant touches, and a spill proof surface. 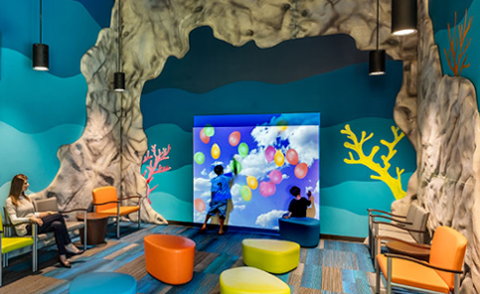 Combining avant-garde design with disruptive multitouch technology, the 48’’ display allows for several people to interact and share content at the same time, in a collaborative and multi-user environment, even under varying lighting conditions. We also have the capabilities to custom design and build Multi-Touch tables of various sizes and shapes to cater to your diverse requirements. We can apply different Multi-Touch technologies into these custom tables for versatility and compliance with different protocols like Microsoft Surface® Toolkit for Windows, Windows 7 HID and TUIO output. NASA, the Official New York City Visitor Center and Medtronic are just a few of the renowned organizations who have used our cutting-edge multi-touch technology. The Illuminate Display provides a clear, seemingly invisible floor-to-ceiling interactive display surface to navigate traditional multi-media with touch-free interaction. 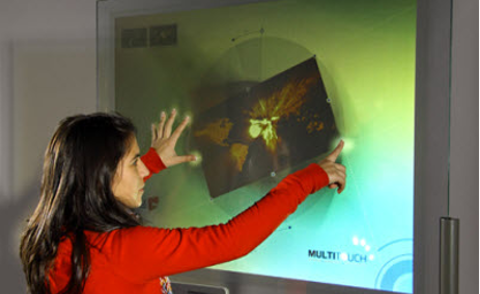 Breathtaking interactive content can be projected onto panels or windows. Images appear to be magically floating in thin-air, with no screens or hardware to be seen. The effect is unforgettable as the display reacts to every point of your finger and wave of your hand. We also offer custom multi-touch solutions for vertical surfaces such as storefront windows. Unrivaled touch experience for all skins. Flexible form factors, clear and highly transparent touch sensors with very high response rates. Size 30" to 105" 20" to 106" 20" to 105" 42" to 55"
PQ Labs G4, G5, G6 Series Multi-Touch overly goes far beyond finger-width frame products. With incredible coin thickness and near-flush surface design, these overlays offer you elegant and accurate touch experience both for integration and standalone use. To learn more about our products and our company, go to: http://www.gesturetek.com.